Haunted house remedies, how to get rid of spirits, ghosts reasons and remedies, Some important questions and answers related to spirits or ghosts, Effects of ghosts or spirits in house or vastu, how to protect our house from spirits or ghosts, Pooja to over come from ghosts, tantra to protect our house, totkay to protect our house, Perfect Remedies of haunted house through occult sciences, Unique ways to over come from spirits. Story of ghosts or haunted house always create excitement in our mind. Every one like to watch movies and serials related to ghosts because it creates sensation, horror, excitement etc. But in real life the person who actually feels the negative energy is not able to share the experience easily. The victim family is not able to share the reality easily with every one because common people do not believe on their experiences. In my life i have been pass from many incidents which insist me to write this article. Daily i get cases from world over and some of them do not know what is happening with them and why. The incidents which actually takes place during ghost attacks are simply not explicable and the things are totally new for the person who is facing this. So it is very necessary to understand this concept. Many knowledgeable and literate friends do not believe on this concept that ghosts exist. I don't want them to believe on this because it is good that they don't believe as they are not affected by this till now and i pray to god that every one must be away from this type of negative energies. it is good to not believe on invisible energies because it is not possible for everyone to digest the truth easily. This article i am writing for those who actually faces the problems in life due to invisible negative energies, this article is for those who are victims of ghost or spirits, this article is for those who want to over come from the negative energies, this knowledge is for those who want to protect their house from spirits, This article is for those who are living a horrified life, read this article with full concentration if you or your family is facing abnormal happenings in house. Before proceeding further it is very necessary to know clear some answers of the questions which generally create confusions in people mind. It will increase your belief and also help us to find the right solutions of our problems. Question No.1: Is ghosts exist or is there any existence of spirits? Answer: Yes, there is an existence of spirit or ghosts. They are present ever where in this world but the main places of their are Intersection of 4 roads, cremation ground area, Cemetery, graveyard, the intersection of 3 roads, deserted house etc. Different types of spirits resides in different types of places. Just for knowledge i have given here some places which are common. Question No.2: What is the difference between ghosts or spirits and ancestors? Answers: I hope every one wants to know the answer of this question. I am giving the answer of this question from Bhagwad Geeta an epic in which lord Krishna has given knowledge to his disciple and friend arjuna. Lord Krishna has given a very good answer of this question that the souls of our family are known as ancestors but the unknown souls create horror and they are taken as ghosts or spirits. Let me clear this point. suppose if after death of any person in family the soul of that member is seen then it will not create fear in mind but if you see any unknown soul in your house or with you then this will create fear in your mind. Question No.3: What are ghosts or spirits? Answer: Ghosts or spirits are actually dissatisfied souls. They are not free from the temptation of this physical world. Untimely death or premature death also is the main reason of becoming ghosts or spirits. These souls are actually strongly attached with their house, family members, wealth etc. Question No.4: Are every ghosts bad or negative? Answer: No, every ghosts are not bad. Some spirits are very supportive. There are many families and person who are thriving because hey are supported by some invisible energies but they are not aware of this. If any positive spirit bless any one then no doubt the person will thrive leaps and bounds. The nature of the spirits depends upon the the human birth in which they were before leaving the body. Question No.5: Is it possible to release any spirit or ghost from the spirit race? Answer: yes, of course it is possible to free any soul from the ghost or spirit race. There are perfect rituals in our epic which if done properly for the upliftment of any soul then the soul gets free from any bond. And of course it's a very good deed. The person who do rituals for the upliftment of spirits or ghost or ancestors gets blessings from those powers and the super power too. It is said that if you are capable of doing any good work for any one and if you are not doing then you are committing a sin. What are the Indications that a house is haunted? This is a very important question that how to know that a place or house is haunted. How to know that there is some problem in any place due to negative energies. How to predict any invisible energies in any place. Let me clear some happenings which will clear you the impacts of any spirits. Family members some times hears strange sounds in house. Sometimes foot steps are heard at the silence time. Abnormal smell sometimes disturb the life of any member. some times it is felt that some one is standing near by. Suffering from diseases without having any genuine or logical reasons. Some times things are scattered here and there unknowingly. Fire any where in the house. Problems in every family functions. Remember houses are not built everyday. It is the result of whole life of a person. If the land or house which is bought by anyone is haunted then think what will happen to him or her. Hunted house not only disturb the main member but the whole family pay whole the life. So it is good to consult any scholar always when doing any auspicious work. It is sometimes a bad luck for a family who suffers due to spirits but not aware of this. Family members suffers from chronic diseases. Different types of accidents take place in the house spontaneously. some times fire starts any where in the house. Some times particular members starts behaving abnormally like as something has entered in his or her body. Different types of sounds comes from the house. Things are sometimes falls any where, Things moves automatically. Nightmares disturbs the family members very much. The whole family lives with fear. How To Experience Good Spirits or Ghosts? If you feel during worship time that some one has come by you then it may be good spirit. One of my friend always told me that while he meditate in his room then some times a waves flow and i just open my eyes to see who is there but not found any one till now. He is experiencing this till today. When i asked me about that i told him that any good spirit comes while you meditate. So don't fear and just continue your meditation. Some times our work gets done automatically without any hurdles, it may be due to good spirits. Some times a very nice fragrance spontaneously arise in room near by, it shows that some good energy has entered in your room. Good spirits never do wrong with the family members. They like cleanliness. Some times when any member ask questions to god then the spirit try to clear it through different ways. Don't Be Confused When You Think Your House Is Attacked By Any Evils? Now i am telling you some ways to do when you think that your house is haunted or there are some evils energies in your house. Some times due to some physical reasons also some incidents takes place and we think that there are ghosts in house. If you are getting sounds then do check the doors and put proper oil on them. If any smell is disturbing you then do check that whether it is coming from outside or not. Ask yourself that are you not suffering from your own thinking or any imagination of ghosts. Sometimes by watching horror serials and by hearing stories of ghosts person starts dreaming about that. Check your all gas connections, light instruments and be assured that they are ok.
Clean every room and through the garbage out side. The very important topic is solutions of haunted house, how to over come from abnormal activities going on in the house, how to protect our house and family members from ghosts attack or spirit attacks. Here i am going to tell you some special ways which will definitely help you to protect yourself. Be positive and with your full will power ask the energy to leave your house but while doing so be polite. Just speak to the energy and say that you are leaving here with your family. So just go anywhere else. If you think that the energy is good then ask to not make any noise and live there quietly in a particular area. Do the deep cleaning in your house from every corner on Saturday or amavasya i.e. on no moon day. Get a crystal charged with special mantras or spells for ghost protection and install it in your house or room which is affected. By placing fountains, fish pot etc are also helpful but it is good to consult before doing so. Burning camphor in every room while chanting special mantra or spell will also free your house from ghosts. Get holy water and sprinkle it in every rooms, roofs etc. Keeping garlic also protects from evils. There are siddha yantras which if installed on auspicious time i.e. on siddha muhurth then no doubt it will protect your house from evil energies. There are pendants which if charged if proper spells or mantra then protect the wearer. some of the pendents are panchmukhi hanuman pendent, kali pendent, Trishakti pendent, special anti ghost protector pendent which is made by special gems and it is charged in a special way. There are special spells which if chant properly then negative energies leave the place. But it should be done by expert only. Various types of utara are also possible but they must be done under keen guidance of expert. Note: There are Other vary powerful ways of tantra, mantra and yantra but it is better to consult before using them. While entering in any deserted house first of all do the vastu poojan i.e. use holy fire and offer things with special spells which is a signals to the energies to leave that place. Be careful while taking house near by cemeteries and graveyard. Don't let your house empty for long days. An empty house is an invitation to ghosts or spirits. While buying any old home just inquire thoroughly about it's past and do the proper rituals or pooja for the peace of the energies which were there earlier. Take proper measures to remove darkness of your house. Darkness always attract negative energies. Sound of Om bell is good. so it is good to ring it daily after daily worship. Don't keep horror images on the wall. Do hawan in every 3 months which will increase positive energy in you house and protect your house too. Worship Kuldevi or kuldevta always. They will protect you from negative energies. On the some specific days do some thing for the upliftment of dissatisfied souls which will help you to get blessings of them. So i think i have told enough on ghosts, spirits and evils. Hope this article will help you a lot. But if you are having problems related to this then you are welcome to my online consultancy services. I will analyze your problems and help you to over come from this with the help of occult sciences. Remember this is not a superstitious. Ghosts exists and they show their presence. In the absence of proper remedies it is not possible to over come from spirits easily. You can contact to get sound remedies of Haunted house. Here in Astroshree you will get trusted services and guidance. Simple Haunted house remedies, remove Haunted house easily with proved techniques. Ghar ko upri hawa se bachaane ke asaan tarike. HAUNTED HOUSE remedies if you are suffering from sleeping disorder. HAUNTED HOUSE remedies TO STOP financial loss. Spell to remove GHOSTS means bhoton ko door karne ke mantra. 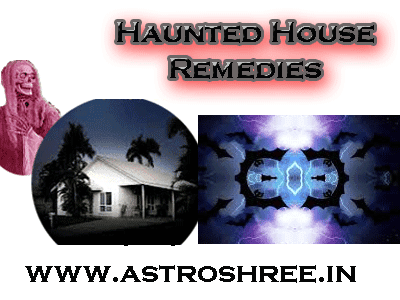 HAUNTED HOUSE remedies to solve domestic problems means parivarik kalah ko dur karne ke asaan upaay. HAUNTED HOUSE REMEDIES if you are suffering from diseases due to ghosts.